Erica’s fast-paced life as a Fortune 500 corporate manager suddenly came to a halt when she collapsed from a stroke. But little did she know, her journey to recovery would lead her to a profound personal transformation. As most of you know, most of my marketing clients are non-fiction authors. I’m pretty choosey about my clients, as I only want to work with authors who write books that bring real value to people and planet. One such client is an inspiring woman named Erica Tucci. Today I’d like to share her story with you. Erica is a stroke survivor. She was struck down suddenly on her way to work nearly 2 years ago. Her stroke left her unable to walk for many months and she couldn’t even lift a finger on her paralysed side. She spent nearly two years in recovery at the Spero Rehab in Katy, Texas. Prior to her stroke, Erica was a real go-getter. She was a corporate manager of a Fortune 500 company. She was also a Reiki master, massage therapist, life coach, and author of three books. She told me she would push herself to work often 80 hours a week. She moved fast, spoke fast and never took time to stop. But then, life stopped her in her tracks when she collapsed onto the floor, unable to move. Throughout her two-year rehabilitation, Erica took her situation as a message from the Universe that it was time to reassess the way she had been living her life. She realized that her stroke, while a traumatic, frightening and painful life-altering experience, was also a gift. It gave her the time and space to change: her thinking, her outlook, her priorities and her lifestyle. 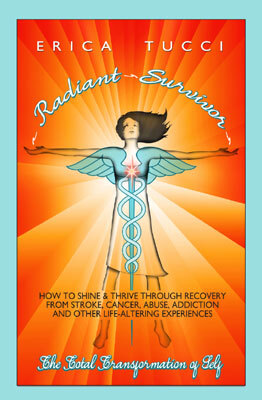 Now Erica has written a book called Radiant Survivor: How to Shine and Thrive through Recovery from Stroke, Cancer, Abuse, Addiction and Other Life-Altering Experiences. It is a collection of inspiring stories from Erica and 14 other ‘radiant survivors’, along with many practical exercises she hopes will inspire anyone facing their own life-altering experience. Her hope is that this book will help thousands of people around the world who may be facing a serious life trauma. The book will be coming out on November 19th, 2013. There’s a reason why I’m telling you Erica’s story so many months in advance. To edit, publish and launch any book costs money. Because she is still living on disability benefits with very limited funds, Erica is running a crowd-funding campaign to raise the money she needs for this project, so she can bring this book to those in need. I’m reaching out to ask you to help Erica with her fundraiser. Between now and Friday June 15th, we are on a mission to help Erica raise $15,000 to cover the costs of editing, cover design, printing, marketing, distribution, etc. All the professionals being hired (including my own team of 7) are offering their services at discounted rates because they believe in the good this book can do for others in recovery. Everyone who makes a donation will receive a nice thank you gift for their contribution. Some of the ‘perks’ on offer include a signed copy of the book, a framed copy of the Radiant Survivor poem, and many other gifts. You could even get a donation of books made in your name to an organization of your choice, or have Erica come speak at a local event. ALSO, if she exceeds the target amount of $15,000, Erica will donate the surplus to the Spero Rehab in Katy, Texas, where Erica spent nearly two years in recovery (that’s Erica in the picture at right, taken a couple of months ago). It’s her way of ‘paying it forward’ for all they have done for her and others. I hope you’ll help Erica and the 14 other contributing authors bring this book to the public. Whether you give $15 or $1000, your contribution will make a big difference to someone you may never meet, but who is in real need of hope. Marketing consultant Lynn Serafinn explains why authors need a video book trailer on YouTube, and shows 10 steps to make one that can get on page 1 of Google. These days, it’s pretty much a given that every author needs a video book trailer on YouTube. What’s funny, though, is that just about every client who comes to me for a book launch—even those with major publishers—have no book trailer. The video was nice (and got nice responses from viewers) but it’s technically pretty basic. Still, it was impressive enough for my clients to start asking me to help them make their own book trailers. Since then, I’ve made quite a few of them, and I’ve fine-tuned the process down to a system now, which makes it easier for me to make them. Given the popularity and strategic importance of videos today, I thought you might find it useful if I wrote an article series that could serve as a tutorial on how to make your own book trailer. The series will have 6 parts (or maybe 7…I’m still working on it! ), spread of the next few weeks. Some of the information I’ll be covering will be a bit technical to some of you, while others will “get it” very quickly. I’ll try to explain technical things as simply and as clearly I can, and will include screen shots as we go along. Before we begin, I feel it’s important to tell you that I’m NOT a videographer. I don’t know how to use any of the slick video editing software on the market like Adobe Premier, Final Cut Pro, Camtasia Suite or whatever else is popular these days. I use dirt-cheap resources for my videos. In a way, that’s a good thing because I’m assuming the majority of you reading this are also not videographers, and you probably don’t have any fancy video editing software either. I’m also assuming you don’t want to spend a bunch of money on equipment OR on hiring a professional to do this for you…which is why I’m aiming to keep your budget down to $77 or less. What I DO have is a background in audio production. I’ve been working with multimedia technologies in one form or another for almost 30 years, both in the music industry and the educational world. I also know a thing or two about how SEO works with YouTube videos. This tutorial will NOT teach you how to make a slick, glossy video production, but it WILL help you create a nice, attractive, fit-for-purpose book trailer that could show up on page 1 of Google searches for your selected keywords. Multimedia platforms (images plus sound plus voice) have long been known to capture people’s attention and communicate ideas better than single-media methods, such as the written word or audio alone. When I did my Masters in Adult Education and eLearning, we learned that creating rich, multimedia content is one of the fundamental elements in effective online leaning materials. Marketers know this too, which is why television and video are such powerful marketing media tools. Multimedia definitely is the most effective communication medium, and the Internet is the easiest and most accessible medium through which to broadcast. It’s WAY easier to get your YouTube video than your website onto the first page of Google. This is because YouTube is the second largest search engine after Google, and has a page rank of 9 (out of 10). It is the 3rd most popular site on the Internet, outranked only by Google and Facebook. This means YouTube will ALWAYS appear ahead of other sites returning searches on the same keywords. If people do a search and see your video on page 1 of Google, they are likely to click on the link to view it on YouTube. Of course, for this to happen, you need to have the right title, description and keywords so Google brings your video up in the search. And once people are on your YouTube page, they need to WATCH your video. And finally, once they watch your video, they need to go to your blog or website. For that final piece to happen, you need to have a well-made, engaging video that answers the answers people were asking when they did their Google search in the first place. Mastering this process is not an exact science or a guaranteed method, but if your content is of good quality and relevant to your audience and you promote your video effectively, your video could be a great traffic generator for your site. In the next article, we’ll look at steps 1 and 2. I’ll be showing you a script template I use with my clients to construct a video script, and give you tips on how to “perform” and record your voiceover. Even if you’ve never used audio editing software before, my tips will help you make a fine recording that is video-worthy. Please subscribe to this blog to receive the rest of the tutorial as it comes out. Please leave a comment below to let me know whether or not this article series will be useful to you. And of course, if you’d rather have someone do your book trailer video for you, just drop me a line via the contact form on this site. Bestselling author and book marketing consultant Lynn Serafinn shares her top reasons why an outline can help you get your book written. It makes writing easier. When you go to sit down to work, you know exactly what parts of your book need to get done. And remember, just because you have an ordered outline, you are NOT committed to writing it in order. You can start anywhere. It makes reading easier. Books that have a structure are easier for readers to comprehend. It makes your message memorable. Readers can remember your message when there is a structure attached to it. It makes abstract concepts more memorable, and enables readers to feel they have gained something they can take away from the book, after they have finished it. It helps ensure you are thorough. If you have an outline, you won’t accidentally omit something vital to your message or storyline. It helps limit continuity errors. While thoroughness refers to ensuring that all important thoughts and details are included in your text, continuity refers to ensuring your thoughts and events following a logical sequence. An outline can help you see the continuity of your book before writing it. It helps ensure your book has symmetry. Symmetry means that all the assembled parts of your book have a “shape” when pieced all together. It helps ensure your book has balance. A good outline can help you see if some parts of your book are less substantial than others. A well-balanced book is organised in such a way that the ideas are balanced both in quantity and in quality against each other. It helps keep you focussed. When you have an outline (and stick to it) you won’t be as tempted to go off on a tangent. This doesn’t mean you will NEVER deviate or come up with great new ideas. But if the outline is there, you can see how these new ideas fit into your original intention. It helps to motivate you. When you have an outline, you see yourself making progress and ticking off the “boxes”, so to speak. This helps keep you motivated as you move closer and closer to your goal of finishing your book. It helps you develop a regular writing practice. If you have an outline to depend upon, you are far more likely to sit down at your desk (or wherever you happen to write) and START WRITING rather than waiting for the “muse” to shoot arrows at you. It keeps your READERS engaged. When you are writing a book, you are like a tour guide taking your readers on a journey from point A to point B. If you don’t know where your readers are starting from, you won’t be able to ‘meet them’ and get them on board at the beginning of the book. And if you don’t know where you’re taking them, a lot of them will hop of the bus (i.e., put down your book) before they get to the destination…if you manage to take them there at all. Case in point: did you notice how I used structure to create cohesion in this article? FIRST decided I would find 10 top reasons, and then wrote down the reasons. Then, I started writing. Because I organised my ideas through a structure, the article seemed to write itself. And for you as a reader, isn’t it a lot easier to remember them than if I simply talked about the topic without a structure? When I first started writing my book The 7 Graces of Marketing in 2010, I didn’t have a structure. I wrote a lot, but I ‘waffled’ a heck of a lot too. I kept moving things around and couldn’t see where I was going. I found myself saying the same thing over and over without realising it, and there was no real over-arching point or direction for what I was writing. Then, one day, about an hour before I was going to deliver a talk on ‘spiritual marketing’ to a group of business owners at the One World Festival here in the UK, I felt really stuck in knowing how to communicate the ideas I felt intuitive, but couldn’t quite put my fingers on. I ‘called out to the heavens’ in sheer frustration asking (out loud), ‘What IS it? What IS it?’ I needed to know the ‘hook’, the outline, the structure of what I was trying to say because without this ‘map’ even I was lost! Amazingly, the 7 Graces (and 7 Deadly Sins) of marketing almost magically appeared in an instant. After that, the book took me another year to write, but I knew my direction every step of the way. Don’t ‘fear’ the parameters of your outline or turn it into ‘gospel’. Just because you decide upon a structure doesn’t mean it can’t (or shouldn’t) bend flexibly as you go along. In fact, if you don’t allow your book to flow where it wants to go within the essence of your structure, you will not be honouring your creative spontaneity, and you might limit the impact of your book. You might first come up with a single outline structure, and they you find more structures within that structure as you write. For example, when I sat down to write my new Twitter book Tweep-e-Licious (coming out Oct 2012) I challenged myself to write 100 Twitter ‘tips’, which I did. Then, when I looked at them, I saw they could be broken into 14 categories, which helped me organise them even more. Then, as I started writing, I found I needed to merge some tips, split some tips into two or three separate tips, and add others I hadn’t thought of when I first started. Eventually, I ended up with 160 tips. Then, I also found the book ‘wanted’ to draw upon the 7 Graces to bring more relevance to the book. Then, the book ‘wanted’ to go beyond practical tips and get into strategies and issues around ethics. The end result was something that was VERY different from my original concept of a ‘quick little eBook on Twitter’. But what I got from it was a substantial, meaningful book with which I’m much happier and I think will bring more value to readers. And the amazing thing is that I wrote this book in less than two months, compared to the two years I took to write my previous books. It all started by creating a structure early in the process, and then allowing the structure to bend and flow. It kept me extremely motivated, and I wrote just about every day because I was genuinely excited about how I felt when writing. an outline, structure or ‘hook’ to your book. It makes you love writing. If you’ve got a book, or a project in you, or a BRAND in you, having a structure to ‘hang it on’ can really clarify your direction and purpose. But many times creative individuals find it difficult to define the ‘hook’ needed to take a book, business or speaking platform forward. While most people know me as a marketing consulting, helping to clarify structures and brands is another way I help authors, speakers, business owners and social entrepreneurs. If you’ve been struggling to find your structure or your unique ‘hook’, please drop me a line via the CONTACT FORM on this site, and we can set up a free 30 minute consultation. So what do YOU think? Are outlines necessary? Are they liberating, doorways to creativity or just plain restrictive strangle-holds? Please share your own book and outline writing journeys with our Spirit Authors readers by leaving a comment below. Lynn is also the Founder of the 7 Graces Project, a budding social enterprise whose aim is to help grow a new generation of passionate entrepreneurs who want to serve both people and planet through innovative, ethical, independent enterprise. Join their community on Facebook at http://facebook.com/groups/7GracesGlobalGarden. Watch for Lynn’s new book Tweep-e-Licious: 160 Twitter Tips and Strategies for Writers, Social Entrepreneurs and Changemakers Who Want to Market Their Businesses Ethically (coming October 2012). Other the past few months, many authors have been writing to me all in a fluster over a controversy that apparently has arisen between Amazon and Lightning Source. I wanted to address this controversy because, frankly, I think a lot of people are having a knee-jerk reaction to what I think is basically an ethical issue, and I would like to show what I think might be a more ‘holistic’ response to it. STEPS 1 & 2: When you are truly self-publishing a book, YOU are also the publisher (so steps 1 and 2 are combined). But if you are going through a subsidiary press (such as iUniverse, Balboa Press or Create Space), you are not 100% ‘self published.’ On the one hand, you ARE self-published in that you don’t need a publishing deal and you retain all rights to your work. On the other hand, you are NOT self-published in that your subsidiary publisher is entitled to (usually) around 50% of your royalties as long as you print through them. STEP 3: In printing, the ‘manufacturer’ is the printer. The publisher (even if that means you) then sends the book to the printer. Either we get a quantity of books printed in advance, or we use a “print on demand” (POD) service. Back when I first started out in the published world (and also when I ran a record company), you typically have to order 1000-2000 copies of your book (or record/CD) in order to get a decent price. Then, you always ran the risk of your publication sitting around collecting dust because you couldn’t move 2000 copies. Since the rise of POD in the publishing industry, that risk and investment has been removed for self-publishing authors. Lightning Source is one such POD service, certainly the most known in the world, and the one I use and recommend to my clients. Instead of having to buy 2000 copies of your book and the ship them to distributors, they print them ONLY when you have a customer for them (whether wholesale or retail), so you only pay for what you know you are going to sell. STEP 4: The next step is to send the books to a distributor who then sells the books to retail shops. Of course, this saves the publisher a heck of a lot of time and energy, so the distributor is one of the most important pieces of the sales puzzle. Distributors typically buy your product between 50-60% off the retail price (55% is the most common), so they can sell it on to retails shops, and the retail shops can make a profit. That means if your book is selling for $10, they will pay around $4.50 for your book. From that price, you deduct your printing costs (I spoke about this in another article – Click HERE if you’d like to read it), and that is your profit. Now what is so cool about Lightning Source is that they will also distribute your book for you via Ingram Book Company. Mind you, that does NOT mean that retail shops will necessarily BUY your book. It just means that they can supply them with your book if they order it. STEP 5: The next step is the retailer. The retailer is the ‘shop’, whether online or on the ground, that sells your book to the customer. Typically, in my experience, retailers in the book and record industry buy your product for between 35-45% off the retail price. That means they will pay about $6.00 for a $10 book, which means the distributor makes about $1.50 per book sold, and the retailer makes about $4.00. However, as we all know, retailers like to be able to have a good profit margin so they can LOWER the price, to be able to entice customers to buy your product OR to get RID of a product that isn’t selling (let’s hope that doesn’t happen to OUR books!). Back when I was a retailer, I often had to sell “dead stock” at cost or even BELOW the price I paid for it. It’s the only way to keep cash flow going. So retailers take a risk every time they buy something. They want to know they can sell it. STEP 6: The last step, of course, is the customer. The customer likes to get a good deal on a product. That’s why, if you give your distributor a good discount in the first place, the retailer will have the freedom to lower his price and get more people to buy your book. The thing that confuses me is how Amazon fits into this picture. Now I have a close connection to Amazon in that much of my business depends upon it, as I work with authors. And as a customer, I have also found them to be both reliable and convenient. Authors love to see their books on Amazon because they can reach a wider audience much more quickly than they could by going only through traditional distribution routes to retail shops. All in all, Amazon is a great asset for us authors. But here’s where things are a bit hazy. According to their entry on Wikipedia, they are it is often called the world’s largest online retailer. Most of us associate Amazon with books, but they have really expanded and now sell just about everything. So Amazon is a ‘retailer’ (Step 5 in the model above) BUT for some strange reason, when it comes to purchasing power, they are not paying the same price for the books they sell as other retailers. In fact, they are paying the price that wholesalers/distributors pay for your book (Step 4). That means they are buying books at an average of 15% LESS than other retailers. This means they have a tremendous advantage in that they can seriously undercut your High Street book shop. As many of you know, Amazon also now has a subsidiary press called Create Space. This means they are also now operating at Step 2 of the model above (I’m not sure who their printer is). This means they are now getting that extra 50% of your end profits when you publish through them. Now, fair enough, I can fully understand that Amazon saw the opportunity to profit from the self-publishing boon. It’s called free enterprise. I have no argument with that, as it totally makes sense. Of course, this makes no sense whatsoever because when you use a POD service there’s no such THING as being ‘out of stock’. Your digital file is always ready to be printed and is in fact printed as soon as the POD service gets the order. Some authors have been writing to me in a panic over this, and asking my opinion if I think they should switch from being 100% self-published to going with Create Space, because then they would be assured to be listed as “in stock” (as Amazon will ONLY guarantee this status for their own subsidiary press). Why? Partially from a practical level, and partially from an ethical one. 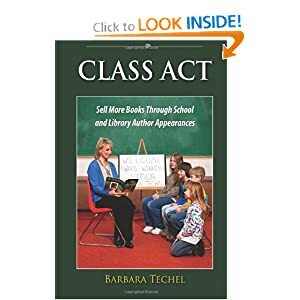 The practical argument: First of all, in my experience, authors who publish through Create Space appear ONLY on the US Amazon site (Amazon dot com) until they reach a certain sales status. I learned this the HARD way when a client of mine launched last year with me, and a couple of weeks before launch we realised she did not appear on the Canadian or UK sites. Now let me assure you, the Canadian and UK mind-body-spirit markets are nothing to ignore! Many of my clients sell as many books in Canada as they do in America, taking them rapidly up to #1 in Canada as Canada has 10% of the population of the US. These are very important markets for spiritual and self-help authors. The ethical argument: Secondly, I have major issues about the ethics of this situation. Amazon is trying to wear 3 different ‘hats’ here: the publisher (Step 2), the distributor (Step 4) and the retailer (Step 5) in the sales chain. Each of these ‘steps’ has ethical obligation to be equitable to their customers, whoever they may be. And the break in this system is the conflict of interest they have between Step 2 and Step 4, which gives them an unfair advantage at Step 5. First of all, I have no idea how Amazon managed to gain the status of a distributor in the first place when they are not distributing to anyone; they are retailing directly to the public. But that aside, if Amazon are playing the role of a distributor to other publishers, it seems incredible that they would treat these publishers—who are their customers—any differently from their OWN publishing company. The two hats have to remain separate; otherwise, what we are verging on is a violation of anti-monopoly trade laws. In fact, I wouldn’t be at all surprised if we hear about a litigation in the near future. One blogger’s suggestion was to go with BOTH Create Space and Lightning Source, so as to ensure your book is shown as ‘in stock’ on Amazon all the time. Well, I’m sorry, but I refuse to succumb to the bullying. 2) Education your audience about the situation. In other words, when you do a launch or publicise your book TELL your readers that it might say ‘out of stock’ on Amazon, and that it is simply not true. Authors should be able to set up their own publishing companies and be treated like any other company. I am a believer in FREE enterprise, which means that big businesses must not be allowed to bully the small business owner out of their own enterprise. Small business owners are the life-blood of the world, and nearly all of our current economy AND environmental problems are due to our current dependency upon big businesses in general. I love Amazon and I have no desire to ‘take them down’. But as consumers, and self-publishers, let’s at least hold them accountable for their behaviour by not reacting to such unethical bullying strategies. All power to the self-published author! The 7 Graces of Marketing: how to heal humanity and the planet by changing the way we sell Coming December 2011.